Town rugs are a category of antique Persian carpets that falls between the informal, intensely personal tradition of Tribal rugs, the more geometric village rugs on one end of the spectrum and the Persian City carpets with their intricate floral designs, extremely fine weave and great technical refinement. Town weavings were the product of small, permanently organized workshops drawing both from regional carpet traditions and the influences of the wider export market. 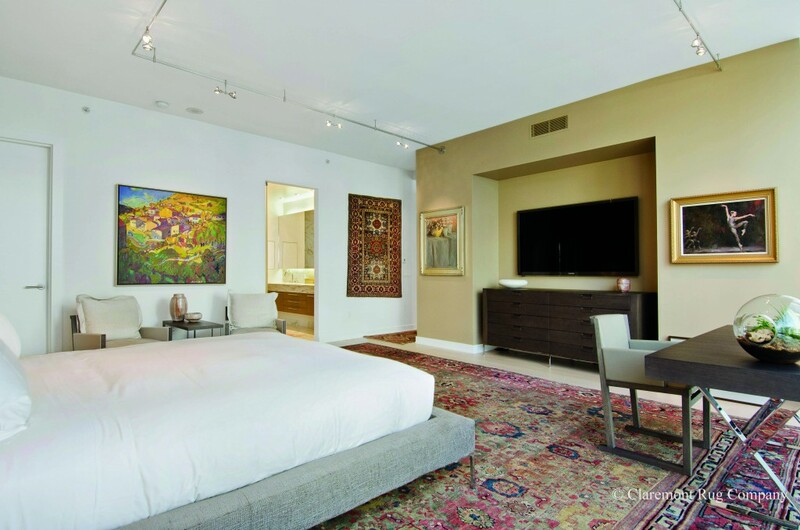 As a result, antique Persian rugs in the town tradition offer a highly versatile combination of formality and playfulness that greatly appeals to the modern connoisseur. 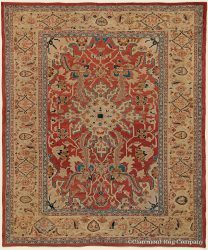 Though produced for millennia, antique Town carpet weaving flourished during the 19th century, when a resurgence in demand from affluent Persian and European buyers encouraged a major increase in output, creativity and quality. The renewed creative focus and attention from foreign buyers often resulted in an extensive cross-pollination among regional styles, as inventive weavers drew inspiration from neighboring traditions or re-interpreted their own traditional repertoire in novel ways. The best town carpets from this era frequently exhibit a strongly individual character, in which the characteristic weaving technique, color palette and pattern language of the local weaving center was fully explored and expressed.  Technical standards remained at a very high level. Patterns in town rugs range from the more formal, as seen in the highly sought after Ferahan Sarouks and in the angular patterns of Bijar (Bidjar) rugs, to semi-formal, as exemplified by the stylized patterning seen in Zeigler Sultanabads. These more relaxed patterns, combined with the bolder color palettes often explored in Town rugs, allow town rugs to be an incredibility versatile art pieces that provide a striking accent or focus in a wide variety of homes. 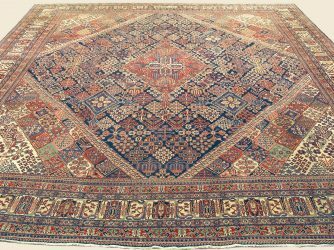 Bijar (Bidjar) carpets are often referred to as the “iron rugs” of Persia, due to their exceptionally high level of craftsmanship. 19th-century Bijar (Bidjar) weavers were known for working with a very high-quality wool and adding additional weft, pounding down the knots as the wove, creating an amazingly sturdy heavy wool foundation that would withstand up to 200 years of heavy use. Bijar (Bidjar) carpets are also distinguished by exceptional artistry, with the finest area sized rugs being referred to as “Halvai” Bijars (Bidjar). 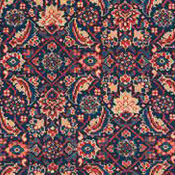 Common motifs used in Bijar (Bidjar) weaving includes detailed “Mina khani” and “Herati” repeating designs, a diamond-shaped medallion, and an anchor-like design as the pendant motif. 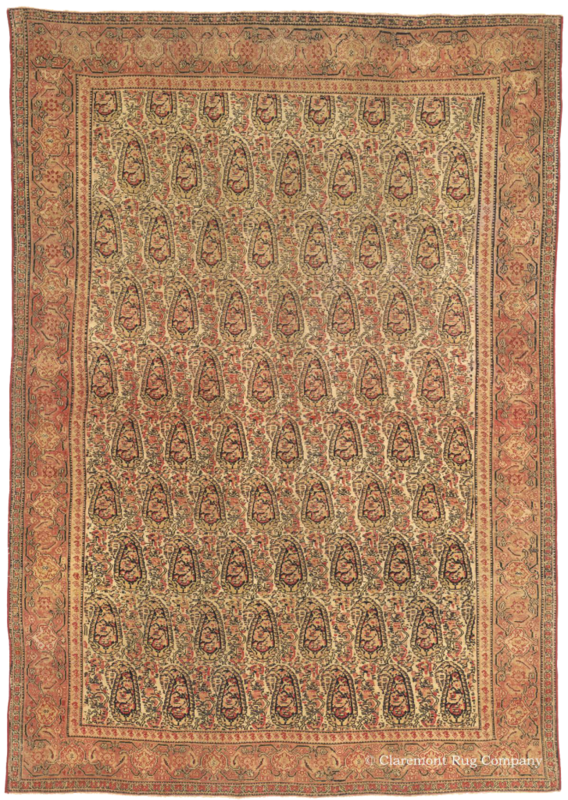 Bijars (Bidjar) can also be found that use stylized flower and vinery motifs, with “Garrus” and “Guli Farang” carpets being particularly sought after. 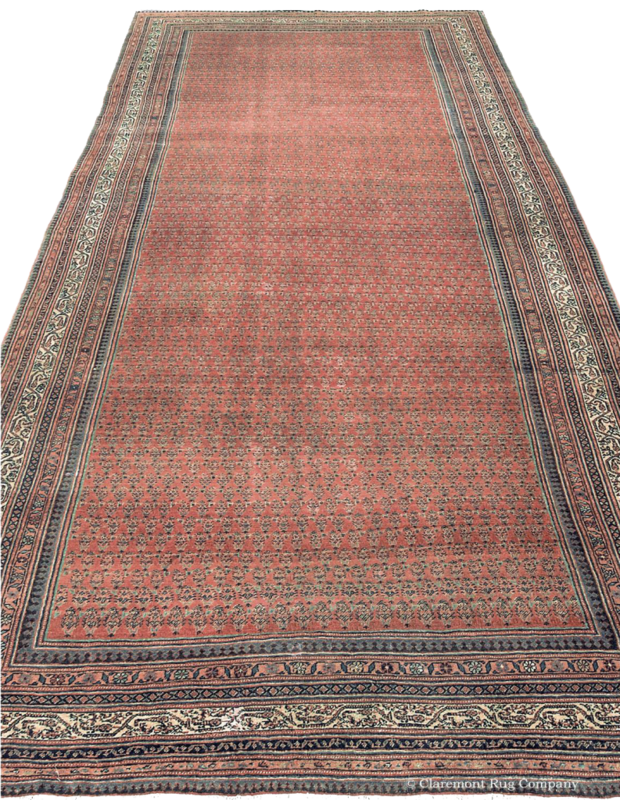 To view a selection of antique Bijar (Bidjar) rugs in the gallery, click here. 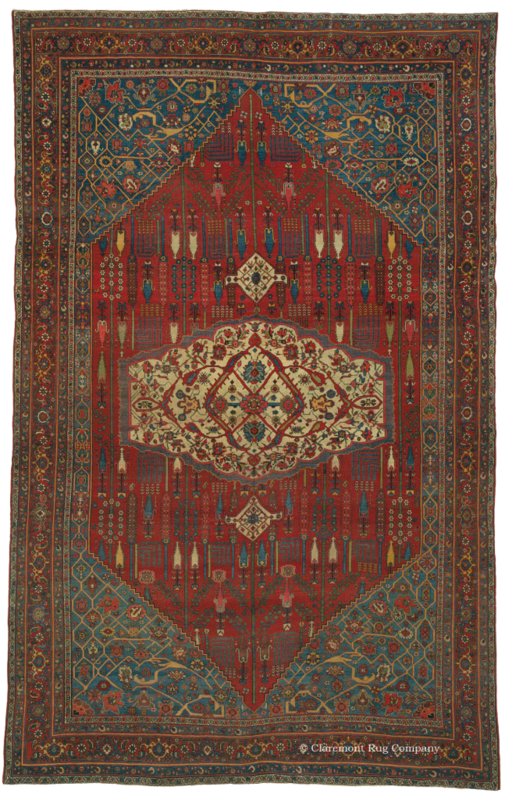 Ferahan Sarouks were one of the most highly sought after rugs of the 19th century, typically commissioned by a wealthy aristocratic clientele. 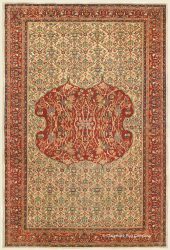 After appearing in the Vienna Exhibit in 1873, Ferahan carpets caught the interest of a European clientele, who started seeking out and commissioning Ferahan and Ferahan Sarouk carpets. 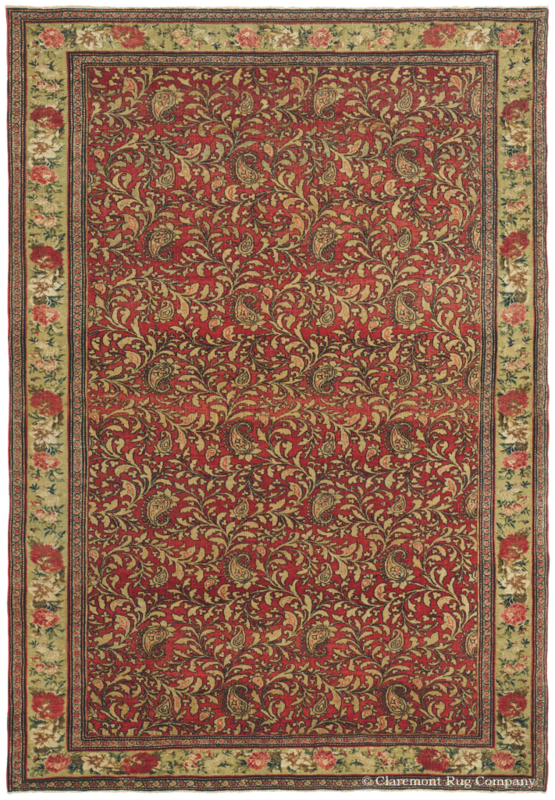 Refined floral motifs dominate, with patterns showing a level of creativity and asymmetry not commonly seen in formal and semi-formal rugs of the 19th century. 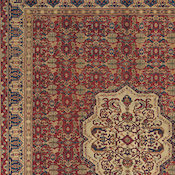 The use of color in Ferahan and Ferahan Sarouk rugs is another distinctive feature, as weavers worked with an expanded spectrum of vegetable dyed tones. A saturated midnight indigo shade was a specialty of the region, skillfully used to balance and accentuate the refined Ferahan color palette. Rare green tones are also frequently found in the best of Ferahan antique rugs, ranging from a delicate soft celadon up to the boldest and deepest of forest greens. The color artistry continues with the use of abrash in many high-end rugs, a technique that creates natural color gradients. To see more of these extraordinary antique Ferahan and Ferahan Sarouk rugs in the gallery, click here. Sultanabad carpets are amongst the most desirable types of 19th-century weaving styles, the product of a cottage industry that were commonly woven by families. They are known for unique interpretations of classical Persian all-over patterns. The most frequently seen patterns are the repeating circular flowerheads of the Mina Khani, Herati with the diamond and curling leaf, and Harshang, a stylized interpretation of the dragon and blossom design. More rarely seen is the Garden of Paradise, or Mustafavi, design, which is highly in demand by connoisseurs. Sultanabad carpets will typically have a thicker pile and more moderate weave than other rugs featured in this category, but the playfulness and creativity displayed in the rugs elevate them to a higher level. 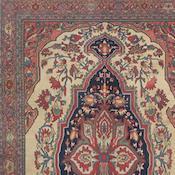 There are two subgroups of Sultanabad carpets, the “Ivory Sultanabads” known for their luminous neutral grounds made of undyed sheep’s wool, and Zeigler Sultanabads. Zeigler Sultanabads were commissioned by a Swiss-English group for export to the European market, and feature a finer weave and thinner handle, as well as a color palette and stylized design that appeals to a Western aesthetic. To view a diverse gallery of beautiful Sultanabad antique rugs, click here. 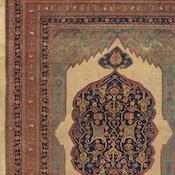 Mahal carpets are a subgroup of rugs from the Sultanabad region. These rugs are in high demand for their spacious allover designs, coveted (for their versatility and casual elegance) by interior designers and connoisseurs. Mahal are most often loosely woven carpets, with a floppy handle and cotton foundations. Though the majority of 19th century Mahal carpets are of medium quality when compared to their more exalted Sultanabad cousins, these versatile rugs nevertheless maintain a generally high baseline of quality where natural dyes and soft, lustrous wool are used, permitting their ready use throughout the home, particularly in more heavily trafficked interior spaces. Occasionally, very beautiful, artistically inspired Mahals were also produced with a subtle attention to balance, color and design that is the equal to any of the very best carpets from the Arak region. To browse a selection of exquisite antique Mahal carpets in the gallery, click here. Senneh was one of the most famous carpet weaving centers of the 19th century, known for the high quality of the rugs produced, which were fine examples of both virtuoso weaving techniques and exceptional artistic composition. Unlike many other weaving regions where the Persian knot was traditional, Senneh weavers almost exclusively used the Turkish, or Ghiordes, knot to produce one of the finest single-wefted weaves seen in antique Persian carpets. Weavers in Senneh used a diverse palette of natural dyes and emphasized harmony in the colors selected for each rug, resulting in graceful pieces with soft, complimentary tones throughout. The Herati design and boteh are commonly seen in Senneh rugs. See which of these rare, enrapturing antique Senneh rugs are available here, in the gallery. Veramin are among the most seldom produced of carpets in the antique 19th-century town carpet category, and are highly prized for their consummate refinement and exquisite, luxurious weave. 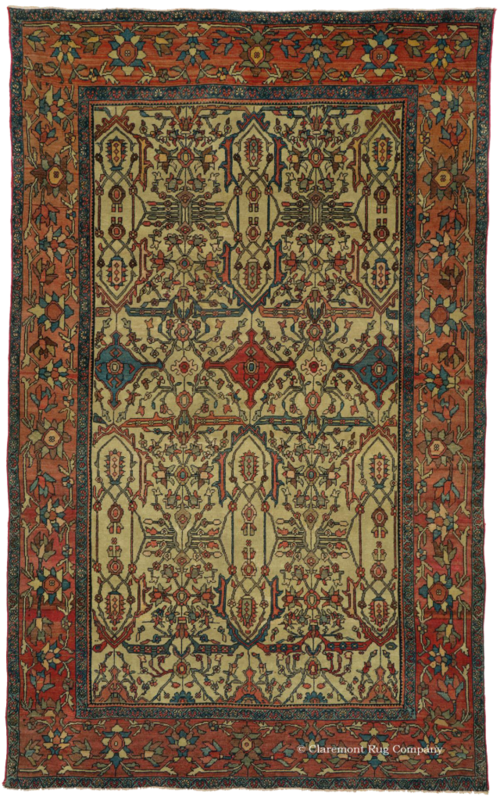 Though nomad woven rugs were produced in the region for a longer period, Veramin became an important workshop weaving center during the second half of the 19th century. Veramin carpets are known for being durable and typically have an allover design, woven without a cartoon to a very high degree of intricacy. 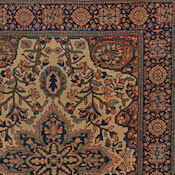 Antique Veramin rugs are best known for a unique rendition of the Mina Khani design and the warm color palette that was typically used. 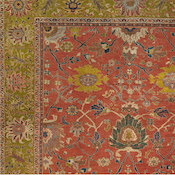 To browse a selection of exquisite antique Veramin carpets in the gallery, click here. Antique Joshegan carpets are among the easiest of 19th-century Persian weavings to identify because of their iconic, instantly recognizable designs. All Joshegans share a universal geometric pattern based on stylized bouquets arranged in interconnecting diamond shapes. This characteristic pattern, produced for at least 250 years, is typically supported by intensely saturated madder or indigo dyes. 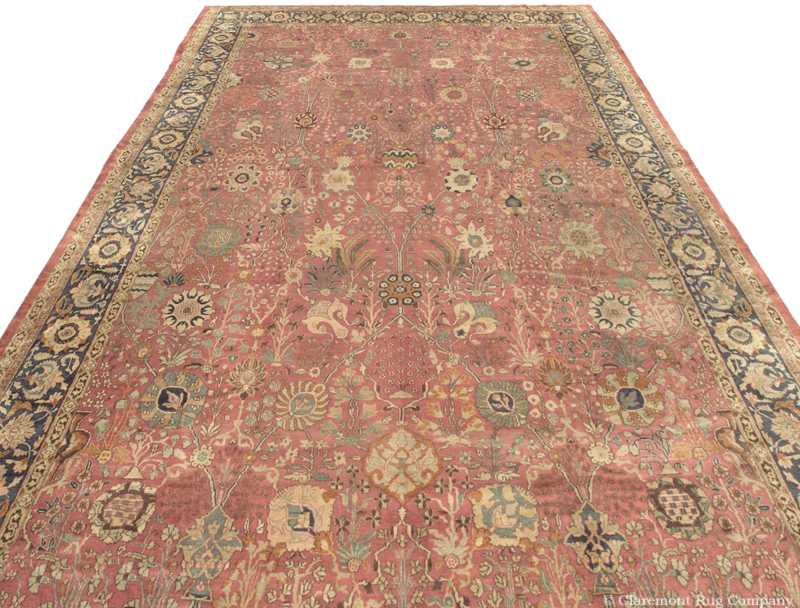 This semi-formal town style bears a very heavy, stiff handle that adds greatly to its durability.To view a selection of antique Joshegan rugs in the gallery, click here. 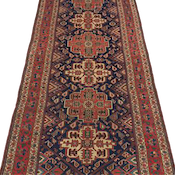 19th-century Seraband carpets are rarely encountered, being produced in relatively small numbers during the antique period. The style tends to favor saturated red fields with repeating boteh (“seed of life”) designs as their central theme. These very small, densely patterned motifs are arranged within the reserve with a strong linear orientation. Borders typically feature the traditional meandering vine and flowerhead design with the characteristic boteh pattern interspersed amidst the vinery segments. These sections are frequently based upon a soft ivory ground. To browse a selection of exquisite antique Seraband carpets in the gallery, click here. Samarkand is a town rug that bridges the gap between weaving traditions of the Central Asian steppe, including Turkoman, and those of China. 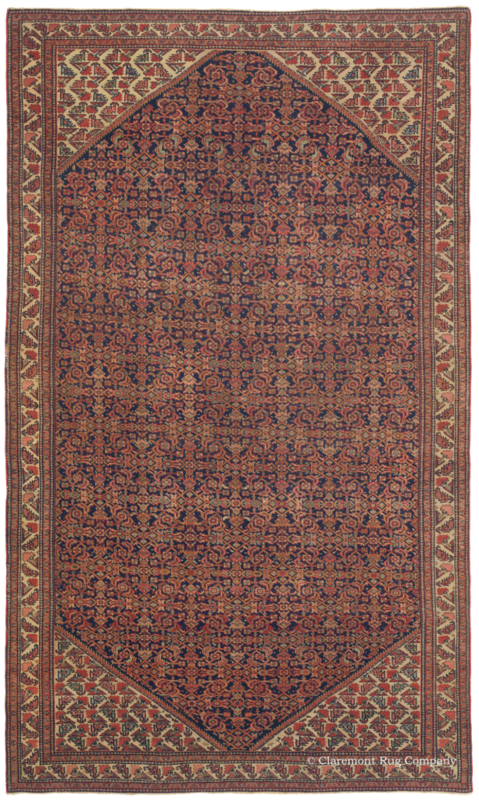 Antique Samarkands present a more colorful, stylized design than what is typically found in Persian weaving, with intense saturation and spacious, open expanses of color frequently used. Chinese red and golden yellow tones are often present, revealing Turkish and Chinese influences. Lotus, cloudband and pomegranate motifs are occasionally encountered as symbolic motifs. Samarkand carpets are known for a very supple handle, with a weave that ranges from coarse to medium-fine. 19th-century examples exist in both area and room size dimensions. 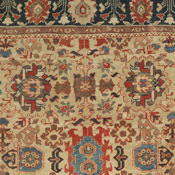 See which of these rare, enrapturing antique Samarkand rugs are available here, in the gallery.